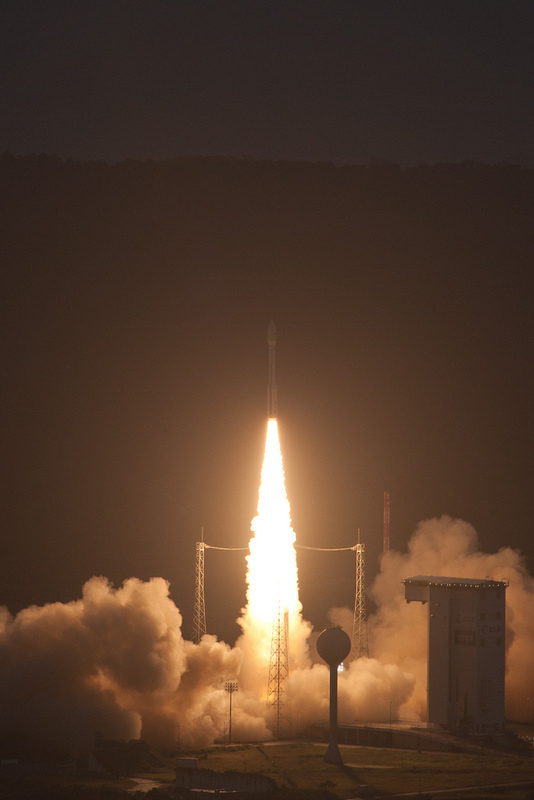 Today, Monday 13 February, Europe’s new Vega light launcher made a flawless maiden flight from French Guiana, successfully orbiting its payload of 9 small satellites. Vega made its first flight today at 11.00 CET. Credits: ESA - S. Corvaja, 2012. Spacefaring Europe now has a full complement of launch vehicles with a new light launcher capable of lofting 2.3 tonnes into low-Earth orbit after Vega completed a flawless maiden flight today, Monday 13 February, lifting off at 11.00 CET. At the end of the final countdown, the P80 first stage developed by CNES fired to boost Vega off the launch pad up to an altitude of 60 km. The Zefiro 23 second stage then took over as the launcher soared above 130 km through the upper layers of the atmosphere. The Zefiro 9 third stage, also a solid rocket booster, subsequently carried it up to 182 km and finally the AVUM liquid-propellant fourth stage precisely placed the launcher’s payload of 9 small satellites in orbit at 1,450 and 1,458 km. Vega is scheduled to launch once or twice a year over the next 10 years, up to a maximum of 4 launches in a year. And with the Soyuz launcher also operating from French Guiana since last year, Europe now has a complete range of vehicles to serve the space launch market.